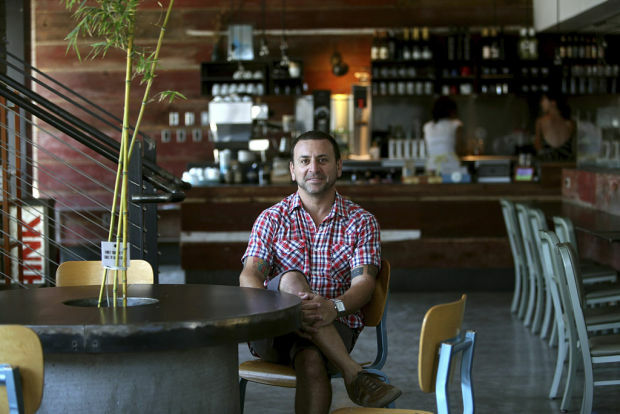 Falora owner Ari Shapiro at his downtown coffeehouse Sparkroot. He also owns three Xoom Juice shops. Tucson restaurateur Ari Shapiro is the master of filling small spaces with big ideas. His three Xoom Juice smoothies shops are each about 900 square feet of airy brightness and clean lines. Sparkroot, his industrial chic downtown coffeehouse, makes use of a narrow Congress Street space from floor to ceiling, with a cozy living room loft that provides unique views in addition to handcrafted Blue Bottle Coffee Co. artisan brews. On Sunday, he plans to debut what some may consider his most ambitious restaurant project: Falora Pizza & Espresso. The 1,100-square-foot Neapolitan-style pizza restaurant in Broadway Village is all brick and slick, from the imported-from-Italy wood-burning Neapolitan pizza oven to the community table that splits the dining room and can seat 26. "It's super-cozy. But it's really, really special. What we did in 1,100 square feet, I think, is kind of remarkable," Shapiro said last week. Falora's menu of wood-fired pizzas ($11 to $15) and salads ($8 to $10) builds on Shapiro's healthful theme with a cast of strong vegetarian offerings. The lineup includes a sweet and tangy Arrosto anchored by eggplant and purple Yukon potatoes topped with salty feta and sweet dates and drizzled with white truffle oil. There's also the Cura, a pie with soppressata, a salami reminiscent of pepperoni; and the Fumo, which employs smoked salmon and goat cheese tempered by capers and red onion. Most of the pizzas are dressed with San Marzano tomatoes, and many use fresh basil and Willcox tomatoes. Falora also has a modest morning menu of espressos and drip coffees, fresh bread, apples and warm brie, and locally baked Grandma Santi Biscottini, with prices running $2 to $6. Falora, 3000 E. Broadway, is tucked into the 1930s shopping center designed by architect Josias Joesler. Contact reporter Cathalena E. Burch at cburch@azstarnet.com or 573-4642. Ramon Luquez saw the heap of metal in his friend's driveway and had to have it.